Royal Air Force Red Arrows jets have departed from their base at Scampton to complete five weeks of pre-season training in Greece. The 11 aircraft left the county on the morning of Thursday, April 27. After refuelling stops in mainland France and Corsica today, the team is expected to overnight in Italy this evening before flying to Tanagra, Greece, tomorrow. The Hellenic Air Force base will be home for the next five weeks, as the squadron completes final training ahead of the busy 2017 summer schedule – the team’s 53rd display season. 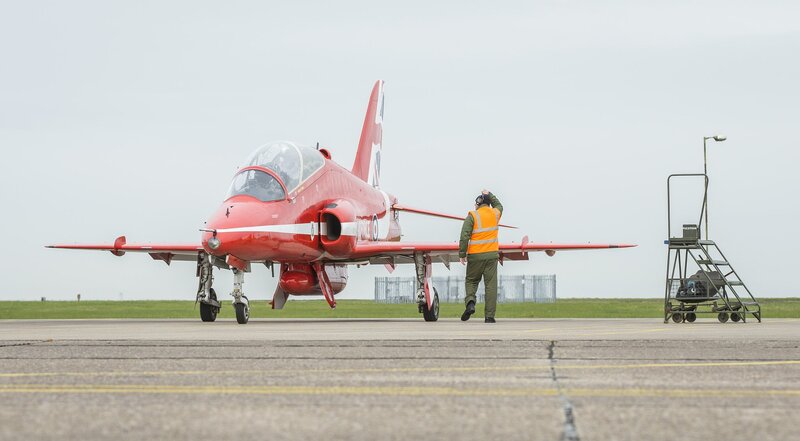 The overseas element of the Red Arrows’ pre-season training is known as Exercise Springhawk and allows the team to perfect its aerial display, which will be seen by more than 10 million people this summer. 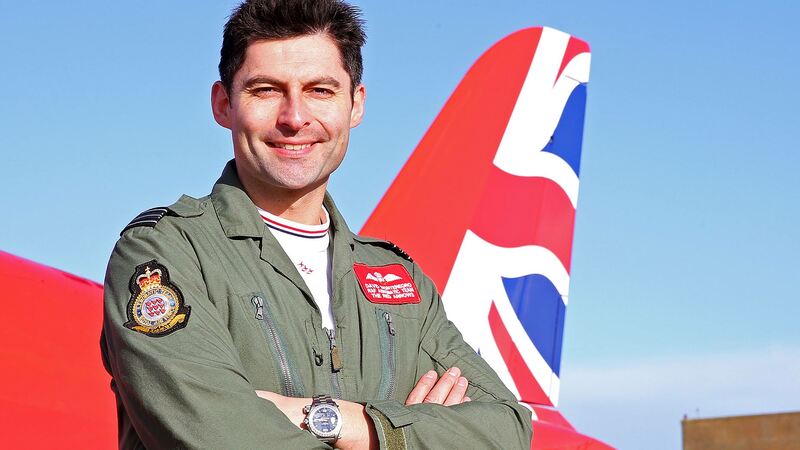 Squadron Leader David Montenegro, Red 1 and Team Leader of the Royal Air Force Aerobatic Team, with the new Union flag tailfin. Photo Craig Marshall, MoD/Crown Copyright 2015. Squadron Leader David Montenegro, who flies as Red 1 and is the Team Leader, said: “We will be once again based at HAF Tanagra and we are immensely grateful to our hosts and, of course, the local Greek community. “It is an important part of the team’s training year and we have very much valued coming to Tanagra for our overseas training through each of the last three years. “Tanagra affords us fantastic different display sites that give us the opportunity to consistently practice the formations and manoeuvres for this year’s display. People can go behind the scenes with the squadron during the five week training season by searching for #Springhawk on social media. “The location affords us to fly in good weather and really get the show as polished as it needs to be. Moving training abroad provides the Squadron with more guaranteed, consistent weather in which to fly – completing up to 15 practice sorties a week. At the end of Exercise Springhawk, senior RAF officers assess the whole team and, if content with the performance, will consider granting Public Display Authority – formally signalling the start of this year’s display season. This year, training for the new season began in January at the Red Arrows’ home base. The team had recently returned from a global tour of the Middle and Far East, notably displaying for the first time in China. As well as the 11 aircraft and pilots, more than 50 personnel, from flight operations staff and engineering technicians to administrators and suppliers, are taking part in Exercise Springhawk. The Red Arrows are expected to return to the UK in June, with the first public display of 2017 at Torbay. It is one of more than 60 shows planned this year for the team.